"Red Delicious are the best apples ever!" proclaimed my oldest. If you make such a claim, you better make sure it is accurate. Ever so helpful I asked him what other apples he had tried and compared. "Uh, those yellow ones you buy? Of the two kinds of apples Red Delicious is the best". MAJOR parental oversight. How is he ever going to win in Jeopardy without knowing at least 27 varieties of apple. So I decided it was time to teach useless trivia to the kids by the means of an experiment. It's what scientists do! We were going to have an apple tasting. So off to the grocery store with the mission to buy one apple of each kind we could find. Ignorant about apples that I am, I thought that would mean about 6 or 7 apples. The kids enthusiastically guessed 16-20. We found 15. Had we agreed on "The Price is Right" scoring rules, I'd have won this one. Evel Knievel was still insisting that Red Delicious are the best apples, and said he would give them the highest scores. The statistician in me raised an eyebrow and took up the challenge. So we put the experiment on hold and talked about objective data collection and cherry-picking (with a little unplanned excursion on why it isn't called apple picking) . Finding the best tasting apple we need to assess taste only. No favoritism! It is a small step from favoritism to profiling, and from there to discrimination. You have probably come across the countless studies how essays or resumes get graded or viewed very differently based on the gender or race associated with the name in the first line. Lesson of the day, collect the data that IS there, not the data you EXPECT to be there. Never assume. So after writing number cards for a true blind tasting, we continued. While I cut and peeled 15 apples (what was I thinking?! ), the boys designed our scoring sheet. Credits for illustration go to Evel Knievel. And then we ate and scored and settled once and for all which apples to buy for the family. The outcome? Evel Knievel prefers Paula Red, Pink Lady and Red Delicious. Although I think he cheated when he recognized Red Delicious by taste. Mr Entropy likes Honey Crisp and Pink Lady, but he made it only half way through the sample, so incomplete data here. The Queen stated her favorites are the ones without the crust, which then triggered a lecture by Evel on the difference between crust and peel. Then we forgot to ask her again. I preferred Sweet Tango and Gala. Finding the best apple choice for the family turned out to be a lot more complex than expected. So we wrapped up the experiment by baking 4 apple cakes with the 15 three-quarters of an apple that were left over after the tasting. Like the space shuttle program bringing you the Teflon pan, science sometimes has unintended benefits. With the apple conundrum solved by creating just more disagreement on what's the best apple, my husband delivered the final lesson on science - that any great findings without a clear implementation plan are doomed. He simply keeps buying the apples that are on sale. How do you teach the scientific method to your children? Leave a comment! The new school year has started and the waves of emotion around Common Core Standards are picking up amplitude. I am not an educator, so I don't have hands on experience about some of the criticism. But one comment I recently read made me so angry, that I immediately grabbed my 6-year old and confirmed that he fulfills the requirement in question. The criticism going viral claims that "this is developmentally inappropriate for young children because they do not think abstractly until much later in life. They do not grasp their state of mind, other people’s states of mind, or the nuances of words". (No, I will not provide a link. This person, despite much media coverage of the claim, did not provide a reference to any scientific research that would back up this or other claims made, so I will treat them as that person's opinion, not fact, until proven). I find this insulting. This person basically just told us children are too stupid to think, or learn the definition of English words. 9-year olds who have played 3 seasons of baseball can tell you the difference between a curveball, a fastball and a changeup. Talk about nuances! Of course none of them was born with that knowledge, but they are able to learn. They learned how to think baseball, to differentiate the paths the ball takes and how to check which definition matched that path. They learned how to think. And now this person said it is developmentally inappropriate for 9-year olds to learn the difference between knowing, suspecting and believing. Well, my 6-year old gets it, so either he is a genius, or children can indeed learn the difference, if taught. I have been pointing out the difference between knowing something and believing something since he is 4. In fact, I consider the ability to differentiate between belief and knowledge, between suspicion and solid evidence, one of the key life skills I want my children to perfect by the time they are adults. Possibly in the top 3 of skills. Everything from deciding whom to vote for, negotiating with a used car dealer, building a future with a life partner, deciding which career to pick and job to take - all these activities require to differentiate wishful thinking and believes based on unsubstantiated claims from the facts, the evidence. Being able to assess where your mind is, and how to move from wondering to suspecting and knowing is key to understanding ANY problem and being able to solve it. This is what it means to THINK. Voila. Little scientists in the making, learning the principles of the scientific method! 1) Wonder: Wondering means to pose a question and to collect a list of possible answers, without evaluating or judging yet which answer is more likely or definitively true. 2) Believe: Believing is to select one of the possible answers to a question, without evidence for its truthfulness and/or without evidence of other answers being incorrect. You pick one and make it your opinion. Why? Just because. I believe we're having ice cream for dinner today. My 2-year old believes that a lot. 3) Heard: Someone else is telling you what he believes, suspects or knows. Unfortunately, that is not considered evidence. People can be mistaken, or lie. You do not make any progress in your own quest. We're having lentil soup for dinner. (Evel Knievel living up to the "evil" part of his name, just to annoy his brother). 4) Suspect: Collecting clues and evidence, some possible answers seem less likely, and one answer emerges as most likely true. I suspect we're having lasagna. There is an empty lasagna box in the recycling bin, and the kitchen smells like lasagna. But when we eat spaghetti, it smells the same. I am not sure. 5) Know: 100% solid evidence that confirms one answer, and rules out all others. I know we are eating lasagna today. I can see it in the oven. See? That wasn't hard! And now your child is ready for Common Core. Well, at least one line item of it. How do you teach your children analysis and problem solving skills? Leave a comment! When I was still a student I once met a family that had a map in their living room, and had marked with different colored pins the places each family member had been to. Since I love traveling, I loved the idea and was determined to do the same. Before we had kids, my husband and me had the chance to visit many different places around the globe, so as soon as Geek #2.1 had arrived I set out and ordered a giant map, 6 feet wide and 4 feet tall. After all, European countries are really tiny, even on a large map, and we needed space for all those pins. Then we realized we did not actually have a wall that was 6 feet wide and 4 feet tall to fit such a map, and so the map is still standing rolled up in a corner of my office. I wish there was a funny twist to this, but the only thing twisted irreversibly now is the map. But thanks to another friend, my children's geography education and awareness of our place in the world was saved. A different giant map now occupies a 6x4 space that everyone has, but few think of using that way - we have a world map shower curtain (much cheaper than the laminated map too). The bathroom turned out to be a surprisingly convenient place to discuss geography. The reason it seems that a 2-year old takes 10 minutes to pull up her pajama pants is that it takes indeed 10 minutes for a 2-year old to pull up her pajama pants. But now the rest of the crew can show each other where grandma lives or how far away our next vacation spot is while waiting on The Queen. If you, too, have vowed that your children will not grow up thinking that Africa is a country, or demanding war in easier to find countries, you could also try board games or puzzles. I have only found US state puzzles in wood, but there are online puzzles that can cover more. 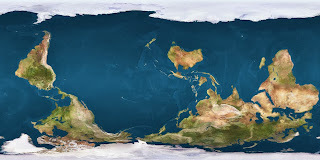 Yourchildlearns.com as a great selection of maps for all continents, the states/territories of larger countries, as well as challenges to place rivers and landmarks (so ... where exactly is Yellowstone again?). Looking at maps not only fosters recognizing and memorizing countries, but can also lead into discussions about history. 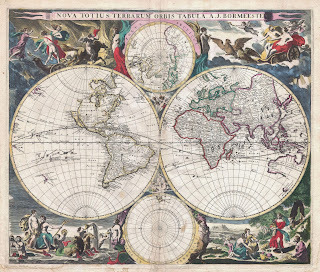 For instance the continent Columbus discovered for the Europeans is called America, simply because two 16th-century German scholars wrote that name on a map they made. (The "Waldseemüller map" is now exhibited in the US Library of Congress). 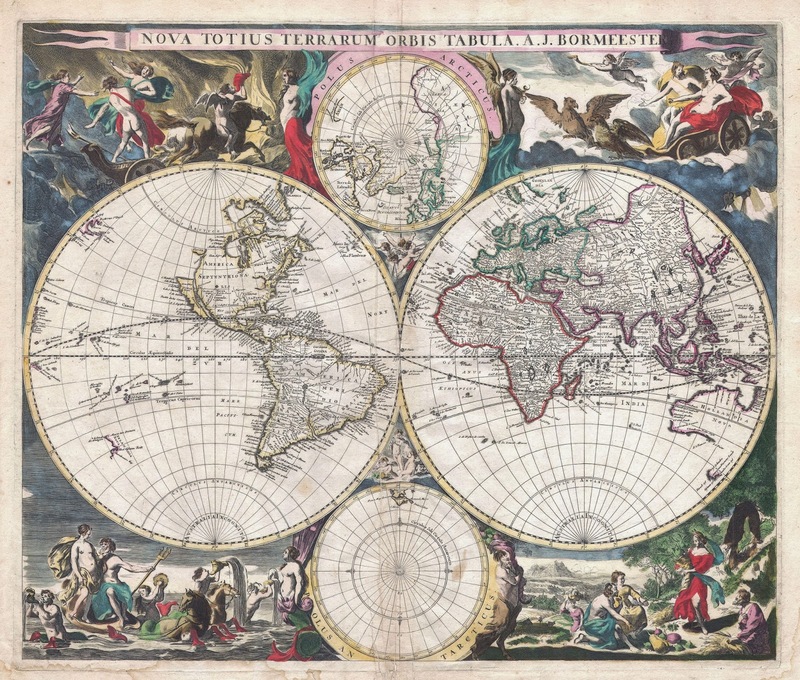 Maps can illustrate wars, social problems, natural habitats, climate, and different cultures. Tell your kids an additional fact about each country they look at, and help them see the connections. Maps can give you a new perspective. And some are just really fun to look at, like this amazing maps collection on Twitter or this blog just about maps.